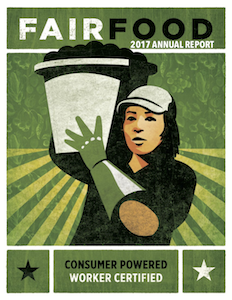 This is the fourth report of the Fair Food Standards Council on the state of the Fair Food Program. It provides the most recent results and analysis from Seasons 5 and 6 of the Program’s implementation. 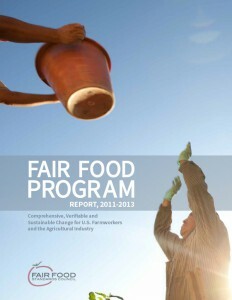 However, unlike past reports, the 2017 version also tracks the trajectory of the Fair Food Program — the unfolding story of increasing compliance through the constant back and forth of audits, investigations, and corrective actions — over the course of all six seasons of the Program’s operation. It is a comprehensive and transparent look at the structure and function of the Fair Food Program and the constant ebb and flow of change that has been brought about in the fields of Florida and six other states. Through carefully detailed quantitative and qualitative analysis, the report tracks a fundamental re-shaping of an entire industry and, in the process, the forging of a model that is already bringing change to many more workers here in the US and overseas. 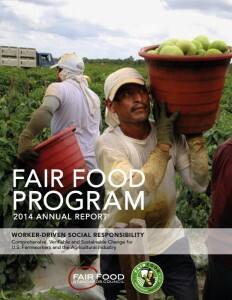 This is the third report of the Fair Food Standards Council on the state of the Fair Food Program, covering the first four years of the FFP’s implementation across the Florida tomato industry as well as the first year of expansion to Florida-based tomato growers’ operations in Georgia, North and South Carolina, Virginia, Maryland and New Jersey. This is the second report of the Fair Food Standards Council on the state of the Fair Food Program, covering the first three years of the FFP’s implementation across the Florida tomato industry. 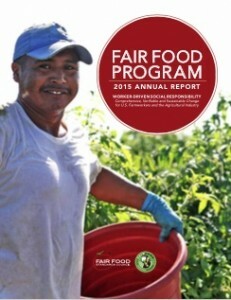 This is the inaugural report of the Fair Food Standards Council on the state of the Fair Food Program, covering the first two years of the FFP’s implementation across the Florida tomato industry.